The Smithsonian Asian Pacific American Center works to present the history, art and culture of American Pacific Americans through research, exhibitions, outreach and education programs. “Young Historians, Living Histories Project”—A multimedia oral history project for young Asian Pacific Americans produced in collaboration with the Center for Asian American Media (San Francisco) and Smithsonian Affiliations. A selection of oral histories will premiere at the annual Center for Asian American Media Festival in March. Asian Pacific American Heritage Month—For the national Asian Pacific American Heritage Month in May, the center will offer a series of public programs that showcase the history, art and culture of America’s Asian Pacific heritage. “Smithsonian Asian Latino Project”—A collaboration between the Asian Pacific American Center and the Smithsonian Latino Center, this initiative highlights the cultural intersections between Asian and Latino cultures through public performances, “pop-up” art galleries and media labs, and workshops with national scholars and writers. 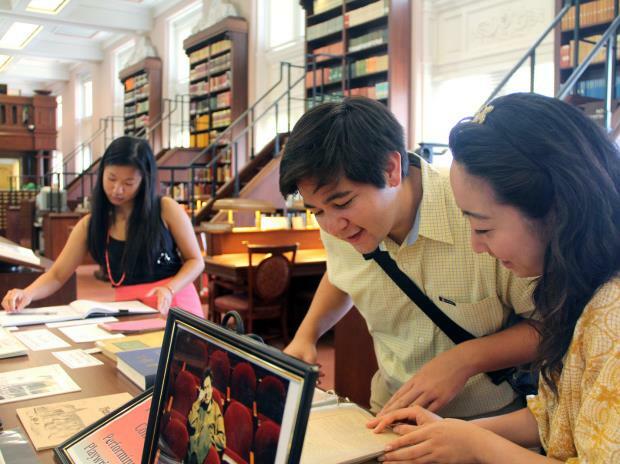 Internships—Each year, the center recruits a select number of undergraduate and graduate students to experience the Smithsonian and learn research and professional skills in cultural advocacy, preservation and study as they relate to the Asian Pacific American experience. “Beyond Bollywood: Indian Americans Shape the Nation”—This exhibition is the center’s largest exhibition to date. Opening in February, the exhibition takes an in-depth look at the contributions, experiences and lifestyles of Indian Americans in the United States. The exhibit will be on display at the Smithsonian’s National Museum of Natural History before touring with the Smithsonian Institution Traveling Exhibition Service. “I Want the Wide American Earth: An Asian Pacific American Story”—Currently on tour across the country with the Smithsonian Institution Traveling Exhibition Service, this exhibition celebrates Asian Pacific American history across a multitude of diverse cultures and explores how Asian Pacific Americans have shaped and been shaped by the course of the nation’s history. Since 1997, the Asian Pacific American Center has created, coordinated and partnered with hundreds of Asian Pacific American initiatives across the Institution ranging from collections, exhibits, cultural festivals, public programs, research, fellowships and internships. This year, the center will collaborate with the Bishop Museum in Honolulu on an Institution-wide initiative in honor of the late Sen. Daniel K. Inouye.